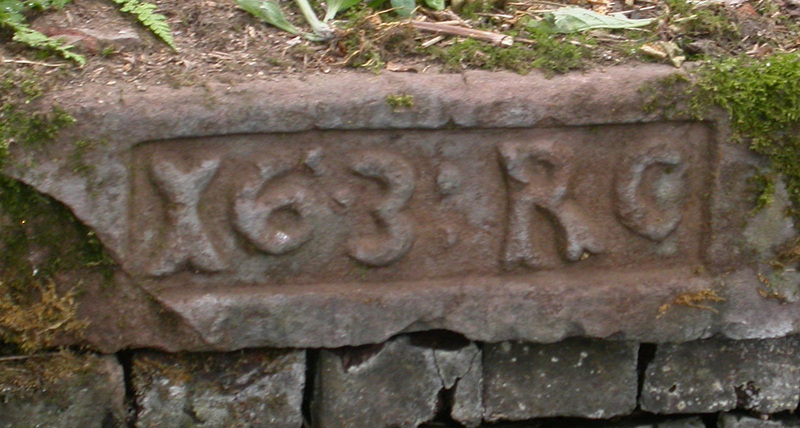 initials RC. There are references to several decoys being constructed on the east coast in the early 17th century, so it is probable that Hale Decoy dates to this time as well. 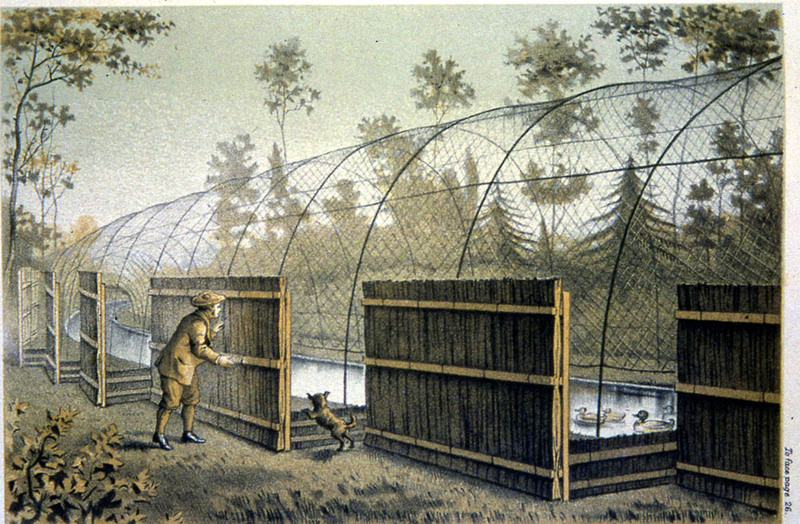 The phrase Duck Decoy almost certainly originates from the Dutch word Eendekooi, which translates as Duckcage. Although no early records have been found, it is known that the decoy was repaired and improved in 1754 by the owner at that time, Colonel J. Blackburne, who moved to Hale from Orford Hall, near Warrington, where there was another (but long abandoned) decoy. 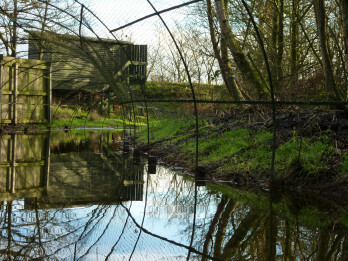 Cheshire Conservation Trust and the Lancashire Trust for Nature Conservation took over the running of the Decoy in 1976. 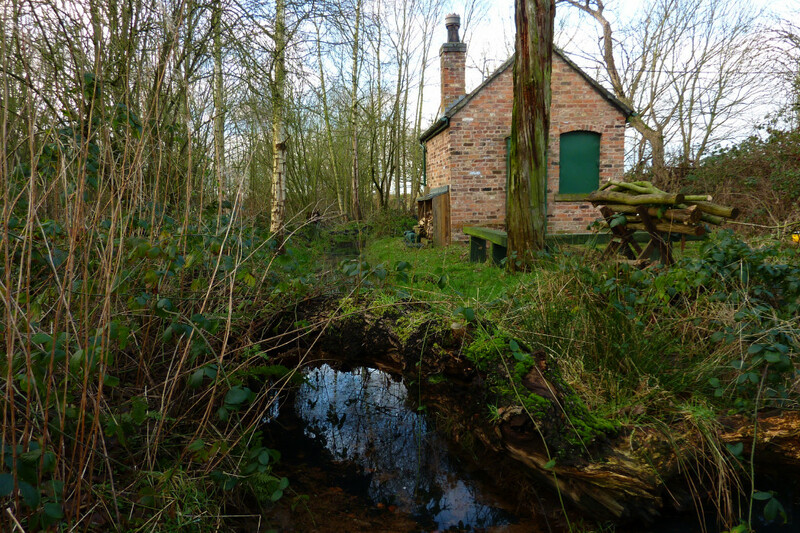 The Decoyman’s cottage was completely rebuilt by the Merseyside branch of the British Trust for Conservation Volunteers and interested local people and hides were erected to view the wildlife. 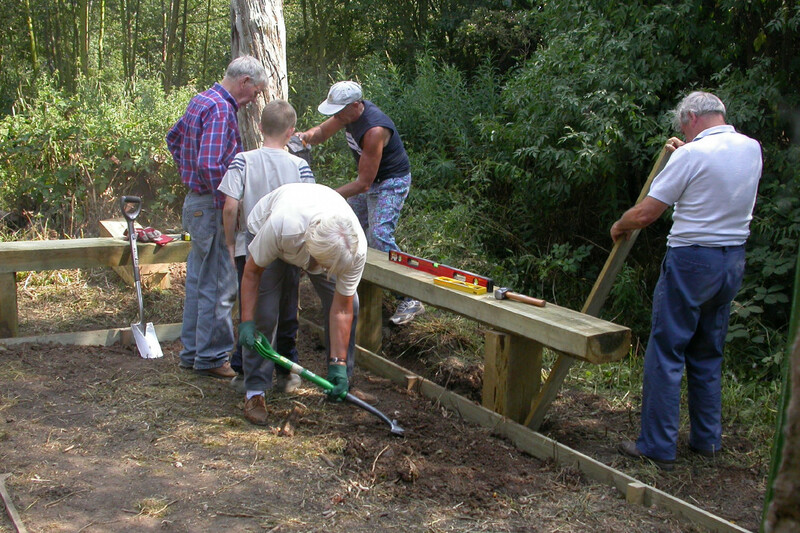 Volunteers have continued to be involved, throughout, in managing and improving the site. 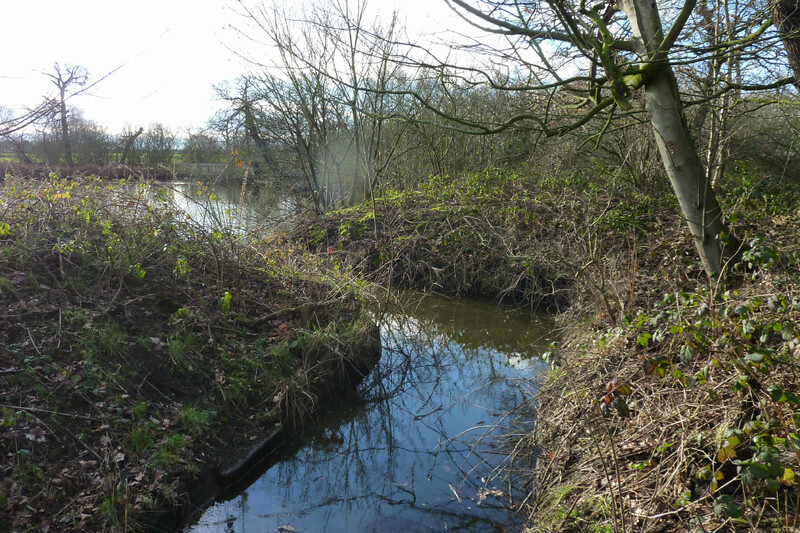 In 2000 Halton Borough Council took over the lease of Hale Duck Decoy, to manage it as a nature reserve, and in 2001 a steering group, of interested organisations and individuals, was formed to secure its future. 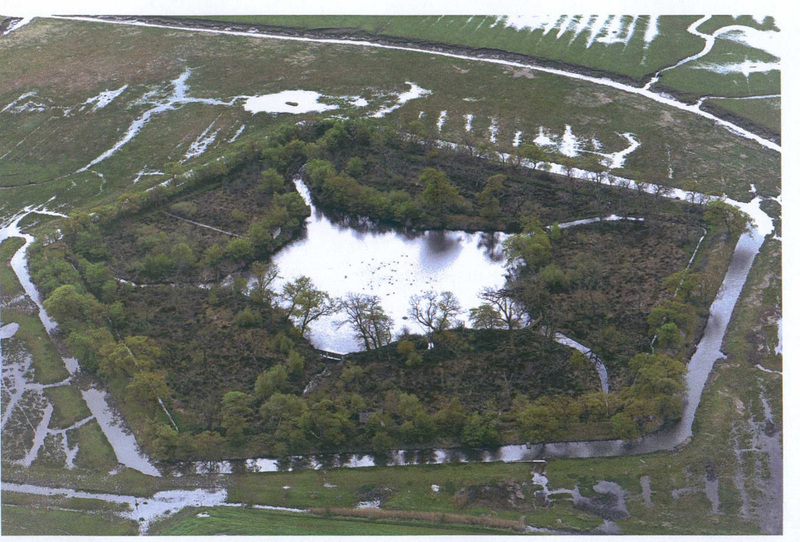 This is now undertaken by The Friends of Pickerings Pasture and Hale Duck Decoy. What is a Duck Decoy? Duck Decoys were an ancient method of attracting and catching duck for the table. The few records that remain from Hale Duck Decoy indicate that catches of over 400 ducks per year were common. These were mainly mallard, wigeon and teal. The largest catch was 1,162 in 1875. Aerial view showing the pool, the five pipes and the woodland. Usually decoys consisted of a shallow pool of about one or two acres, surrounded by trees, which would shelter it from bad weather and enable the duck to rest within. The pipes which radiated out from the pool were sited so that the decoyman could approach at least one pipe downwind. The pipes were about fifty yards long, curving away into the trees and had metal hoops stretched over them. These varied from twelve feet high and twenty feet wide - diminishing in size as they curved away from the pond until they were just two feet high and two feet wide. 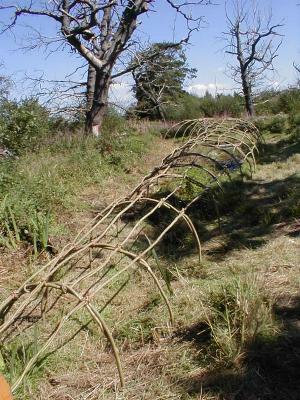 The hoops were initially made from willow, hazel or ash and eventually metal and were covered in netting. This winter view demonstrates the diminishing sizes of the hoops. A duck's view of the netted hoops. How did the Duck Decoy Work? The wooden screens were set at an angle to hide the decoyman. Along the outer curve of each pipe wooden screens were sited at an angle so that the decoyman could move about behind the screens without being seen by the ducks on the pool. The ducks were encouraged to enter the pipe by using the natural instinct of wildfowl to react to potential predators. 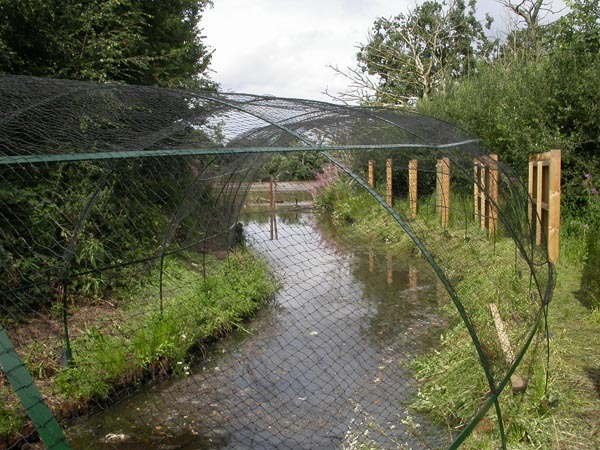 A dog slipping in and out of sight as it moved down a line of screens would draw the birds down the pipe until they were flushed forward by the decoyman into the narrow end of the hoop and into the catching net or cage. At Hale the dog, traditionally called Piper, was a brown fox-coloured terrier. 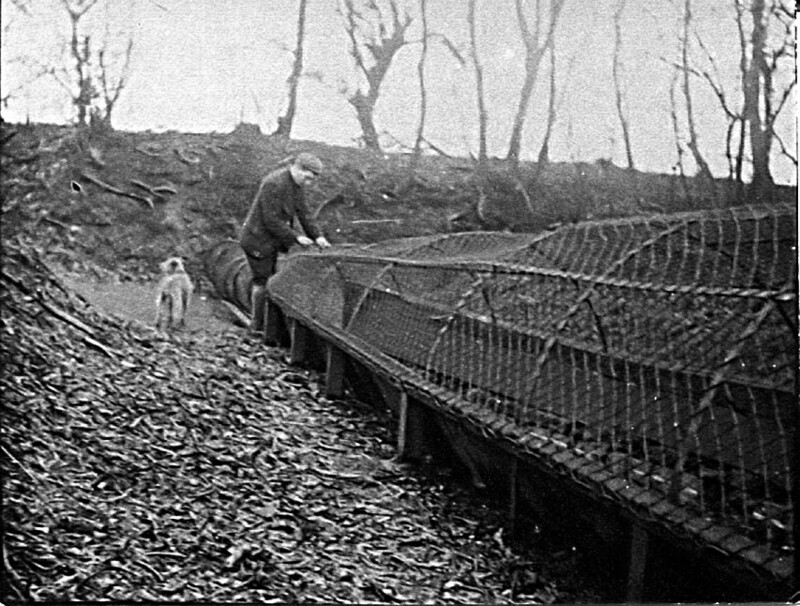 The Decoyman and his dog at the catching nets. Picture from a glass slide c1890. This was traditionally part of the duties of the gamekeepers of the Hale Estate. 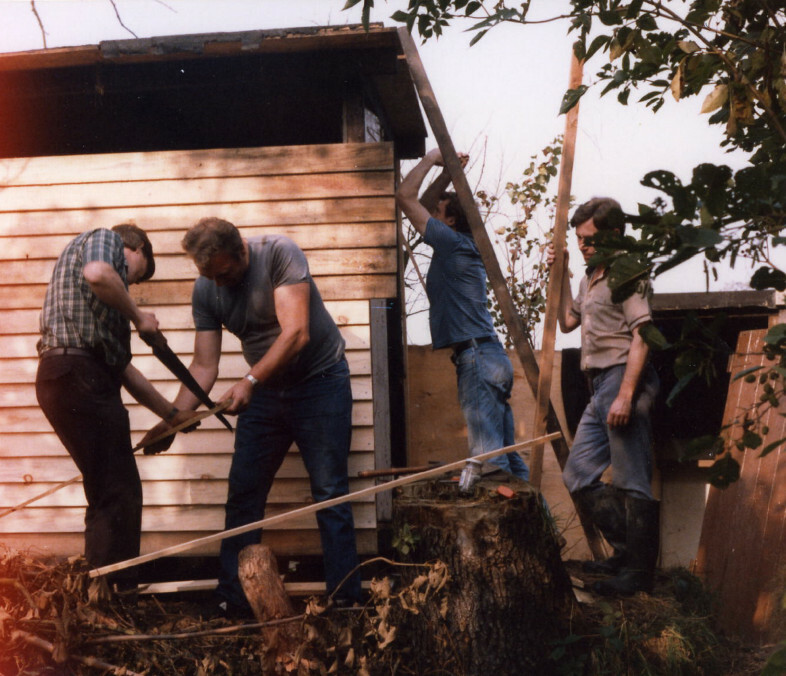 A cottage on site provided shelter and storage. 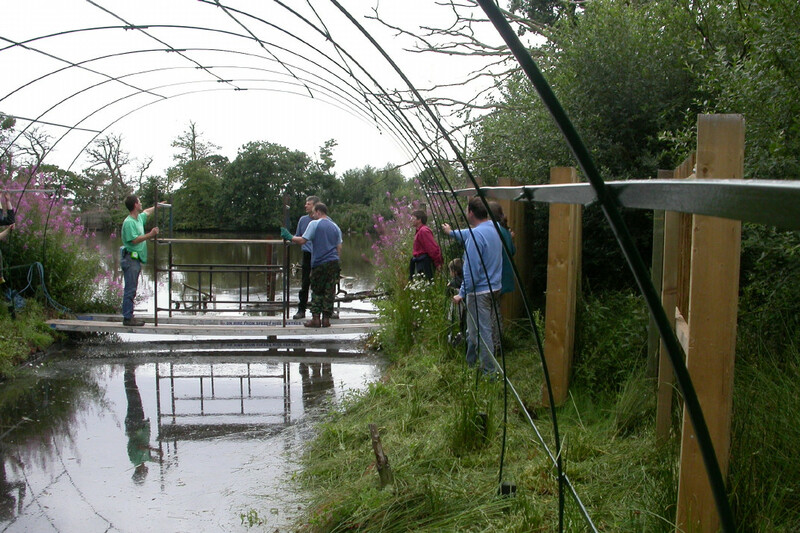 been erected to obtain a close view of the birdlife both on the central pond and on the surrounding marsh. 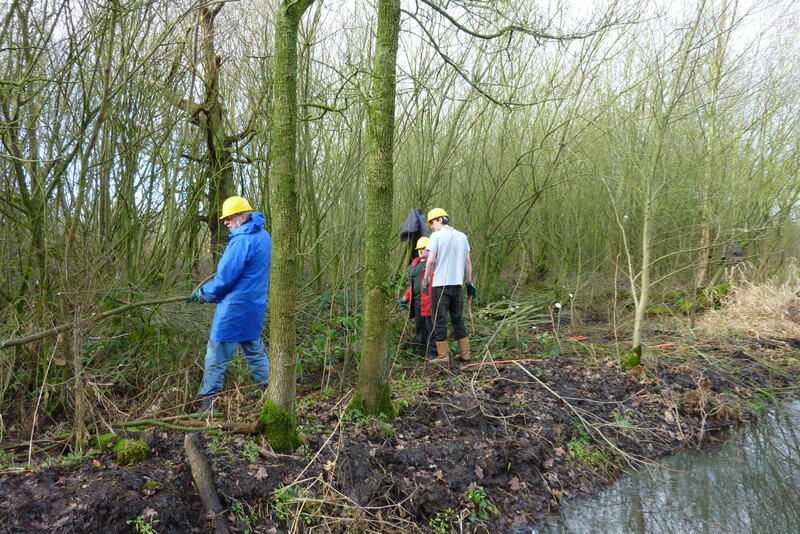 Volunteers have also helped to maintain the vegetation balance by removing invasive plant species such as bramble, sycamore and bracken and by planting over 1,500 new trees and shrubs. 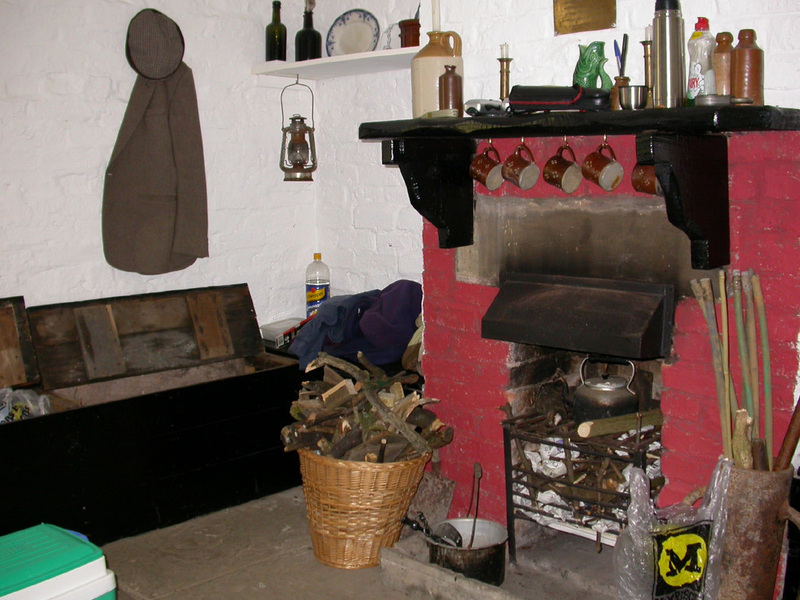 The Decoyman's cottage was rebuilt by volunteers. They held a Memories Event to gather historical and anecdotal information, followed by a series of interviews and recordings with local people. 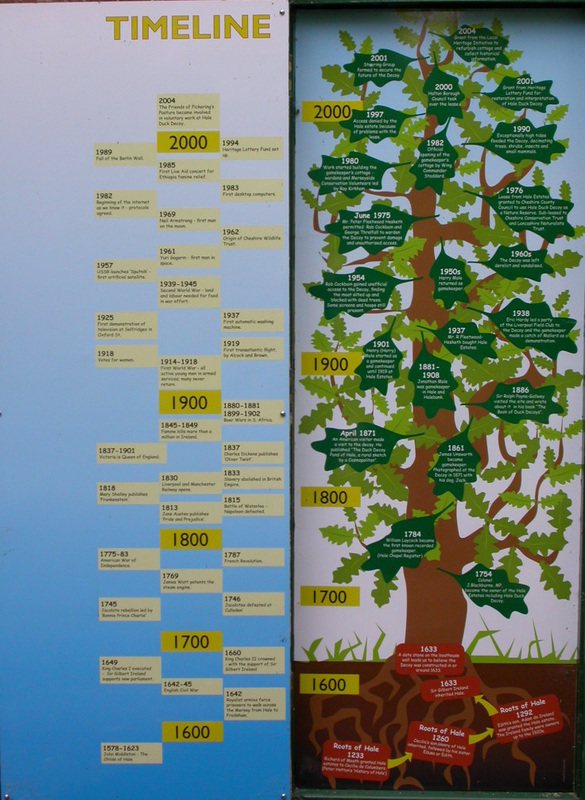 The information gathered was used in the leaflets, folders and History Tree and in the development of our original website. 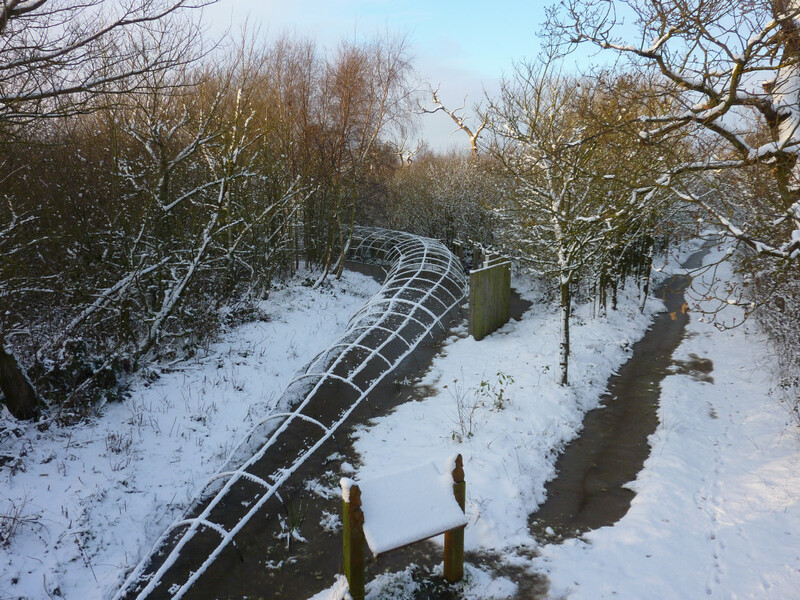 The Heritage Lottery Fund took over the administration of the project in 2006 and the project was completed in 2007, headed by Lynda Broad, of The Friends of Pickerings Pasture, and supported by the Ranger, Rob Smith and Conservation Officer, Paul Oldfield, of Halton Borough Council. In 2010 Halton council, in view of the current economic situation, disbanded the Ranger service. The management of the Decoy was then passed over to the Parks and Open Spaces department, supported by the Friends of Pickerings Pasture. Decoy date stone. It can be found in the boat house area of the central pond. This is where the gamekeeper would have kept his boat. The boat would have been used to enable him to undertake routine maintenance work in and around the pond. We are not sure if the stone was placed there to indicate when the Decoy was built or if was reclaimed from another building site. 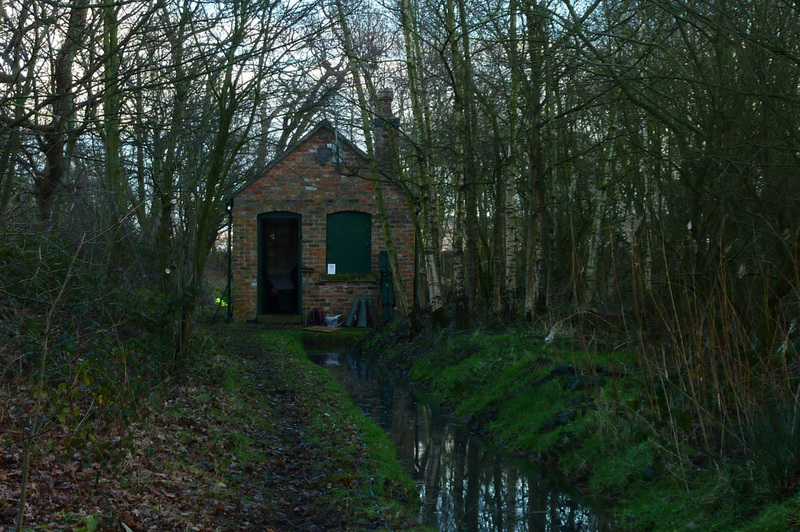 The area known as the Boat House. It isn’t quite clear what the stone says. It has been suggested that RC stands for the “Reign of Charles”, which fits well with the time we would have expected the Decoy to have been built. There seems to be an X followed by a dot and a 3 followed by a colon. We have interpreted this date as 1633 because we believe that the Decoy must have been constructed around this time. We may be mistaken and would be interested to hear of any other interpretations.